The highest slots on my environmental bucket list are filled with goals to see oldgrowth forests and unexplored wilderness– to visit the rainbow hot springs in Yellowstone or stand under a giant Redwood in Fern Canyon. I celebrate with a triumphant internal fist pump whenever I hear that environmentalists were able to protect land from damage and development. The more these places are protected, the more likely we all have a chance to hike forests filled hundred-year-old trees, watch hatchling sea turtles crawl towards the ocean, and see a towering glacier firsthand. Sometimes I focus so much on the protection of environments that have the least amount of human interference, that I overlook the natural potential in places much closer to home. Columbia Mine Preserve in Pike & Gibson counties is mostly mineland, reverting to nature on 1,050 acres of lakes and woods. Rare species including bobcats and Bell’s vireo have been seen there. Land damaged by decades of mining, landfills contaminated by PCBs, or farmland that has gone through countless seasons of plantings could easily be passed over in our mission to protect the environment. These developed and highly used places can often seem too far gone. But with a one-track mind towards untouched nature, a place like Beanblossom Bottoms could have seemed unworthy of saving. Truthfully, it’s hard to find untouched nature. Human influence ranges from raising modern cities to pre-colonial activities of native people. Traces of human activities can be found in even the most remote places, from the depths of the Mariana trench to the top of Mount Everest. Most “natural” spaces are products of human decisions and influence. We’ve changed ecosystems through species loss, pollution, and habitat destruction. But we also construct “natural” spaces when we choose to preserve, conserve, or rehabilitate them. 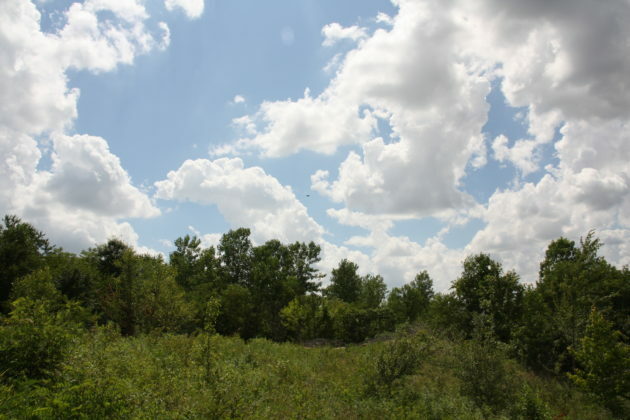 Sycamore’s Beanblossom Bottoms Nature Preserve was cultivated farmland for generations, and what it has become now — 25 years later — is no less a product of human cultivation. Be it the planting of 50,000 native trees, the removal of reed canary grass and Japanese honeysuckle, or the construction and maintenance of wet meadows for the Kirtland’s snake, humans are an integral part of this ecosystem. We have sometimes gently, sometimes actively steered its growth toward an ecologically brighter future. It’s important that we see the potential in human-touched places like Beanblossom Bottoms, in part because that’s simply our ecological reality: We live in a world that is highly human. The more we focus on an environment that is separated from human interaction, the more limits we impose on the places where we can do important environmental work. We should look at farmlands, neighborhoods, and backyards just as frequently as “untouched land.” It’s in these places where we can make the simple changes — to plant native species like butterflyweed or purple coneflower, install nesting boxes, weed instead of apply herbicides — that can decrease our negative impact on the environment. And it is in these places where people have the opportunity to make the simple connections — to learn to identify a red-bellied woodpecker or taste wild clover, sassafras, and wood sorrel — that can lead to a lifelong environmental ethic and an ability to see the natural potential in all spaces. Someday, we may find that we’ve helped create the spaces within our communities and neighborhoods that allow us to check a couple of items off our bucket list.